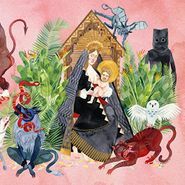 Father John Misty’s fearless second record builds on his folk-rock sound with orchestral touches, genre diversions and direct, conversational lyrics that cut through singer/songwriter clichÃ©s. The title track introduces Beatlesesque melodies and weeping steel guitar to prepare you for the scope of the record. J. Tillman starts going into crooner mode with the spectacular “Chateau Lobby #4 (in C for Two Virgins),” his crushed-velvet vocals singing over a sweeping, country-symphonic arrangement, but his lyrics nicely keep the romanticism from getting too gooey (“I wanna take you in the kitchen/Lift up your wedding dress someone was probably murdered in”). “True Affection” takes a sharp turn into MIDI-electro-dream-pop, with some Fleet Foxes-style harmonies keeping things grounded in Tillman’s wheelhouse. “The Night Josh Tillman Came To Our Apartment” takes another turn, this time into Velvets-third-album twinkling indie pop, while Tillman calls out an airheaded groupie (“She says like, literally, music is the air she breathes,” he sings hilariously). Tillman’s lyrics work so well because of their specificity—you feel like you’re watching him break hearts at a local bar when he sings “Why the long face? Blondie, I’m already taken,” over a sultry Southern sway on “Nothing Good Ever Happens At The Goddamn Thirsty Crow.” Such subject matter could read as self-serving, if not for the album’s more self-effacing tracks, like “The Ideal Husband,” in which Tillman admits various wrongdoings, petty or otherwise, over nervy rock ‘n’ roll; or “Bored in the USA,” a piano ballad that seems to mock Tillman’s own first-world problems of alienation and dullness (“Save me, white Jesus!” is an awesomely cutting exclamation). Tillman’s refusal to do anything in a typical way while still keeping the music highly polished helps I Love You, Honeybear to never feel indulgent. Rather, it’s an extraordinarily giving album, as Tillman’s honesty and strength as a songwriter and performer has grown immeasurably. It’s easily one of the best albums of the year thus far. Soul Jazz’ kickass Punk 45 series continues with a set of late-’70s jams that makes Cleveland seem just as punk as London or New York was. The Pagans’ “Street Where Nobody Lives” threatens to fall apart with its crusty distortion and shambolic beat. Jazz Destroyers' “Love Meant to Die” shakes and skitters irreverently, while Pere Ubu’s early single “Final Solution” tears it up with a rock ‘n’ roll chorus and disjointed future noise. There are tons of bands to discover here, from Broncs’ Buzzcocksish howl to X-X’s squawking no-wave noise, and cult bands like Electric Eels are well represented, with a couple of wild tracks including the deranged “Bunnies.” Anyone interested in punk and how it came to form in various cities over time should check this out, as well as anyone with a need for fresh proto-punk nuggets that go down like razor-laced candy.